After 25+ years as an advertising creative director working on a wide variety of accounts I decided to listen to my heart and follow a new path. The “V” Channel was born. Instead of pitching and selling consumer products, I’m now “selling” virtues, encouraging and persuading young people (and their parents) to choose a higher standard of behavior. A person with “high ideals” is someone who really cares about what is right and meaningful in life. When you practice idealism, you have beliefs that mean something to you and you follow them. You don’t just accept things “the way they are”. I believe that we can “Bring out the best in our children and ourselves” by practicing virtues. I refuse to accept that “reality” TV, violent video games and self-absorbed celebrities is “just the way it is”. I don’t believe that today’s young people are cynical with ADD. I believe young people want to be good human beings, and that The “V” Channel is one to help them become the best they can be. Being an idealist means believing in making the world a better place. You believe it so much that you are willing to work really hard to make it happen. Deep in my heart I knew I had more to offer the world than advertising. I left a high-paying career so I can spend as much time as possible to launch The “V” Channel. I’m working freelance, and barely paying my bills, but it’s worth the sacrifice to bring something special to world. Idealists dare to have big dreams and then act is if they are possible. They can imagine something and then do it. I envision The “V” Channel producing hundreds of positive, creative, entertaining, and most importantly, useful virtues lessons. Idealism does not mean that you are an idle dreamer. Idle dreamers just wish that things were better. Idealists do something to make things better. This “V” Channel blog is just one part of the social media mix. It’s actual proof of all the planning and hard work put into this project. When people don’t have ideals, they just live as if nothing matters very much. They have no dreams of what is possible. They settle for whatever happens. People without ideals don’t strive to improve the conditions in the world. Without idealism things would stay just as they are. No one would have a vision of how things could be better or even what is possible. The best they would hope for is that things wouldn’t get worse. No one would be trying to improve; no one would be growing or developing. Unless people have ideals, when bad things happen, they would just let them. People would get more and more discouraged. Bono, lead singer of U2, is a great example of someone who practices idealism. Idealism begins by picturing what you would ideally like to see happen. It is visualizing wonderful possibilities. It could be a vision of what you will be when you “grow up”. No matter how old you are, it’s never too late to practice idealism. But you’ve got to make it happen. Look at where you are and where you want to go and make a plan to get there. Like Bono, people who accomplish great things have all started with an ideal. Keep it simple––start by picturing something that is not too difficult to attain: the ideal wardrobe for instance. Or picture the ideal friend, someone that would be perfect for you to enjoy and spend time with. Then you can go for the ideal car or job. 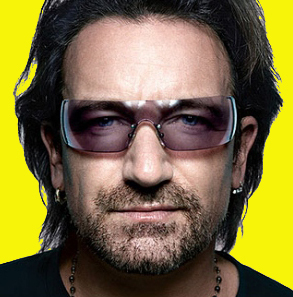 Who knows, you may end up like Bono having ideals that affect millions of people around the world. There are usually people around to tell you that your dream is impossible. When you are practicing idealism, you make a plan and then stick with it no matter what people say. Finally, make sure that your words and your actions match. Don’t say you believe in peace, for example, then go around bashing people. You would like to see you school free of prejudice? People tell you that your dream is impossible? You want to make the ideal gift for your mom or dad? You feel somewhat hopeless about achieving a goal? You have a dream of becoming a great musician? All of us at The “V” Channel encourage you to practice idealism and experience the benefits of living life at a higher standard of behavior. Stay connected! Like us at Facebook. We’ll be posting more virtues stories and videos in the near future. Email me today at Scott@theVchannel.com. When you join The “V” Crew you’ll be helping to guide the next generation toward a common belief that virtues can shape a world where people are willing to take personal responsibilities. Hoyt, so sorry I missed your comment… just read it. Blew my mind! Randall McMurphy saying, “At least I tried. At least I did that.” is so close to my heart. For years I have referenced that scene after failing to do or make something “special”. The Robert F. Kennedy quote, “There are those that look at things the way they are, and ask why? I dream of things that never were, and ask why not?” touched a nerve and gave me hope and faith to keep trying to make something “special”. I believe in the power of ideas. I believe that by seeing the world as it should be, rather than as it currently is, that is how you begin to bring about change and recreate reality. The problem with that attitude is that it is defeatist right out of the gate. The people who say that have shot themselves down before they even meet an ounce of resistance or opposition. They become their own worst enemy, their own impediment. That is is the essence, the epitome of idealism. It is imagining what could be instead of resigning one’s self to what is.